Gunnysack Hill is the section of Highway 99 located approx-imately between 170th St. SW in Lynnwood and 148th St. SW in unincorporated Snohomish Coun-ty. According to an article in the Everett Herald, it was part of "the new Everett-Seattle link in the Pacific Highway" which open-ed to traffic on October 25, 1927. Richard Telford of Edmonds re-calls that his family lived on a triangle of land on the northeast corner of what is now 156th St. S.W. & Highway 99. He and his sister Dolores had the job of put-ting kerosene lanterns out on the wooden bridges built across the new concrete at 156th and 164th. He recalls watching the workers spread gunnysacks over the fresh-ly set-up concrete and putting dirt over that to season the concrete. That is not why the name gun-nysack came to be attached to the hill, however. That occurred after traffic began to flow along the new 14 mile long, 20 foot wide strip of pavement between the King county line and the Everett city limits. As the new section of highway neared completion, the Everett News reported "Road opening to mean new law. problem. ", Road 'houses, Chicken dinner inns and dance halls were expected to be erected along the new route, but Sheriff George I. Stever warned that the south end of the county would not be permitted to become a "honky tonk." A squad 'of deputies was dis-patched on a Saturday night and made three arrests at Jungle Temple No. 2 and Doc Hamilton's barbecue ranch, confiscating "a small amount of alleged moon-shine whiskey, and arresting three people." On the hill that would become known as "Gunnysack Hill," the first-building was certainly not a "honky tonk." G.C. Keeler, a gro-cer, built a two-story building with living quarters upstairs and a "mom & pop" grocery store and gas station downstairs. Keeler's daughter-in-law, Gladys of Lynnwood, recalls that another building was erected east of their property at the same time. Although the owners of the two buildings shared a common well, the Keeler family did not patronize the Willows road house. "The old milk trucks would chug a chug up the hill so slow, I could grab on to the back and get a ride up the hill,". said Telford with a chuckle. A few years later, he got a job pumping gas at the Texaco station built near his family home north of Keeler's Korner. Doc Brimmer sold produce grown behind the station, and al-though Telford said he wouldn't want to mention the word 'bootleg," he believes some customers bought liquid from jugs kept under the desk in the office. When the weather turned cold, early autos would skid out of con-trol on the ice before they reached Keeler's Korner. Vi Grand of Ed-monds recalls that a man named Ole Bloss, who had a farm at the bottom of the hill on the west side, supplied stranded motorists with empty feed sacks to put around their tires. Eventually, the 'hill became known as Gunnysack Hill. was a long-distance call to phones serviced by the Alderwood phone company across the new highway. During the winter, older chil-dren who' lived within walking distance of the highway, would go sledding. "The highway was wide open all the way from the top (of Gunnysack-Hill), and you could get up tremendous speed" relates Jack Thompson, of Carbonado, Washington. Look-outs would watch for lights and warn of ap-proaching cars. In the summer, Thompson re-calls, he and his friends would ride their bicycles up Gunnysack Hill to Mud Lake (Lake Serene) to swim. One lucky day he and Bill Marson were passed by an ice cream truck. The doors had come open and ice cream was falling out in front of them. Today's children must wait for the traffic light at 168th St. SW to turn green if they want to buy ice cream at the franchise on the northwest corner of the inter-section. Loop Service has been replaced by a convenience store. The gunnysack ranch has disappeared and building supply discount stores, fast-food restaurants and strip malls line both sides of the highway down to 180th where the hill' levels off and a discount appliance store has replaced the Levelton Feed Store Mr. and Mrs. Grand built in 1929. Keeler's Korner, listed on the National Register of Historic Places in 1982, now sells antiques instead of gas and groceries and 'Doc = Brimmer's -gas-station -has evolved into a clock shop. The High Point feed store at the top of the hill said to be the "high-est point between Seattle and Everett" has been replaced by a strip mall - the High Point Plaza. 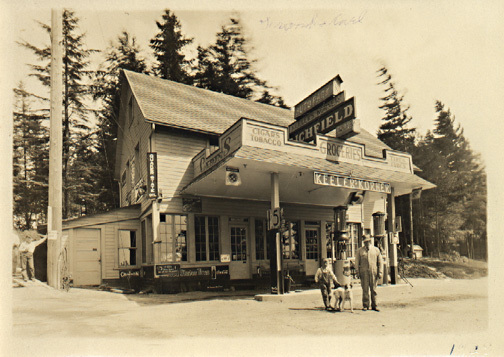 Old timers have witnessed many changes along Highway 99 in south Snohomish County, but the name Gunnysack Hill remains as a reminder of days when life, as w ell as traffic, move d through Sno-homish County at a slower pace. Photo caption: Keeler's Korner, now listed on the National Register of Historic Places, was built in 1927 when Hwy. 99 linking Everett to Seattle was opened to traffic.